I can’t do this. No one will read it anyway. I don’t even know where to begin. This is hard. Have you ever said any of these things to yourself? As The Book Professor, I help people write books that change lives, save lives, and transform society. But it’s the people I meet that want to write a book but have sadly talked themselves out of it because they don’t believe they can do it. When you’ve built your life on a lie, it’s hard to overcome that thinking. I say “lie,” because deep down these lies boil down to one thing: the belief that you aren’t good enough. I believe its the lies we tell ourselves that prevent us from doing the things we were meant to do and for which we are gifted. I don’t know what lies you tell yourself, but I know the truth. You do matter. You are important. You can help other people. 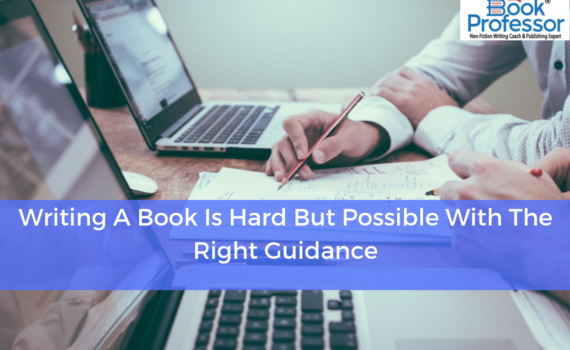 Writing a nonfiction book is hard at times, but you can do it with the right guidance! Maybe you survived a harrowing experience and want to give others the strength to fight through their issues. Your business expertise may have driven you to the top of your field and you’d like to help others succeed. Perhaps you’ve been blogging for years and have built your brand and you’re ready to write a book. There are so many reasons to write a nonfiction book, but people always seem to focus on the reasons why they can’t. They make excuses like, “I’m not a writer” and “I wouldn’t know where to start.” Working with a book coach online can help you start and finish your book, and it will ensure that you put out a quality product. Life is busy and it can be difficult to not only sign up for classes, but it also takes the time to commute to class. When you work with a book coach online, you can access instructional videos, lessons, and handouts at any time, day or night. Your study time is whenever you want it to be. My Group Writing & Publishing Program includes homework assignments that will ensure that you are making progress on your book, as well as one-on-one coaching sessions. Halfway through each of the 3 modules, you will have a 45-minute one-on-one coaching session where you can go over your work in greater detail, discuss any issues or challenges you are facing, and receive valuable feedback. At the end of each module, you will have another 45-minute one-on-one session to discuss your overall progress in depth. The Group Writing & Publishing Program is perfect for people who want constant motivation and feedback. Without structure, it’s easy to put off writing your book. The Group classes force you to carve out time to work on your book. Each 16-week module includes weekly Group Coaching calls that allow you to discuss your progress and get feedback from other members. In short, it’s your own Book Mastermind! The lessons are available online all the time, and the weekly Group Coaching calls are scheduled on the same day and time each week. Flexibility for solo study is great, but the regular meetings with your fellow writers ensure that you receive your weekly dose of motivation. They give you the chance to share what you have been working on, receive feedback, and workshop with other authors, while providing accountability and guidance, every step of the way. If you’re not a writer, don’t worry. You don’t have to have one sentence written, and you don’t have to be a professional writer to publish a powerful nonfiction book. You simply need to have an idea – and the commitment to see the process through, and I’ll help you every step of the way. To get more details about the curriculum, read testimonials from past participants, and to register for the next session, click here!